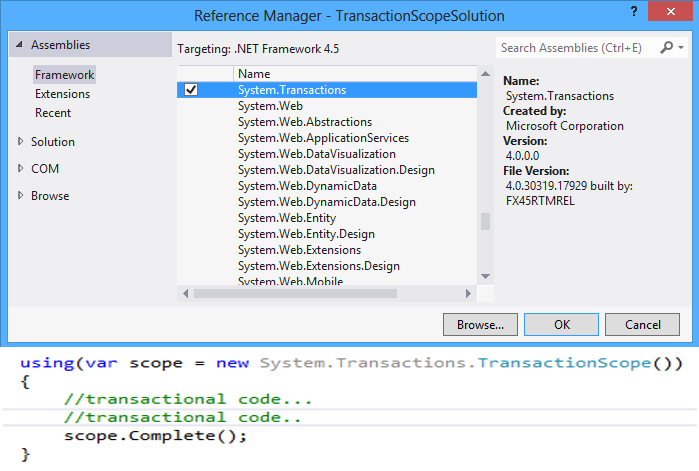 TransactionScope is a very special and important class in the .NET Framework. Supporting transactions from a code block is the main responsibility of this class. We often use this class for managing local as well as distributed transactions from our code. Use of TransactionScope is very simple and straightforward. It is very reliable and easy to use. For this reason it is very popular among .NET developers. In this article, I explain transaction related theory with code sample, and show various scenarios where we can use TransactionScope with various options for managing real life transactions. Transaction management is very, very important to any business application. Each and every large scale development framework provides a component for managing transactions. .NET Framework is a large development framework and it also provides its own transaction management component. Before the launch of .NET Framework 2.0 we used SqlTransaction to manage transactions. From version 2 .NET Framework has the TransactionScope class. This class is available in the System.Transactions assembly. This class provides a transactional framework with the help of which any .NET developer can write transactional code without knowing much details. For this reason it is very popular among .NET developers and they widely use it for managing transactions. But the story is not finished yet. I will say the story has only just started. In the real world any one you will find exceptional scenarios, exceptional issues where only a knowledge of how to use TransactionScope is not good enough. To resolve transactional issues like deadlocks, timeouts, etc., you must know each and every concept directly/indirectly related to a transaction. There is no alternative. So the concepts of a transaction and its related components need to be clear. Add a System.Transactions assembly reference to the project. Create a transactional scope/area with the help of the TransactionScope class starting with a usingstatement. Writing code which needs to have transactional support. Execute the TransactionScope.Complete method to commit and finish a transaction. Really, as simple as that. But in a real life project only that knowledge is not sufficient. You need more transaction related knowledge, otherwise you can not handle transaction related issues. So first of all, we should be clear about the transactional concept. What is a transaction? You can find the definition of a transaction from various sources like Wikipedia, other websites, books, articles, blogs. In a very short, we can say, a series/number of works treated as a whole, either completed fully or not at all. We understand that transfer of money (from Account-A to Account-B) consists of two individual processes. Transferring money will only be accurate and successful if both the processes are individually successful. If that is not happening, suppose process-1 succeeds but process-2 fails, then the money will be deducted from Account-A but not deposited to Account-B. If that happens, it will be very bad and no one will accept it. Business transactions are interactions between Customer/Supplier/StackHolders and other parties who are involved in doing business. In this article I am not going to present anything regarding business transactions. In software development, when we say transaction by default we guess that it is a database transaction. In a database transaction we can say, a series of data manipulation statements (insert/update/delete) execute as a whole. All statements either successfully execute, or will fail each and every statement, so that the database is in consistent mode. Database transactions actually represent a database state change in an accurate way. A transaction where a series of data manipulation statements execute as a whole on a single data source/database. It is actually a single phase transaction handled by a database directly. To manage local transactions, System.Transactions has a Lightweight Transaction Manager (LTM). It acts like a gateway. All transactions are started by System.Transactions are handled directly by this component. If it finds the transaction nature is distributed based on some predefined rules it has a fallback transaction to the MSDTC distributed transaction. A transaction which works with multiple data sources is called a distributed transaction. If a transaction fails then the affected data sources will be rolled back. In System.Transactions, MSDTC (Microsoft Distributed Transaction Coordinator) manages distributed transactions. It implements a two phase commit protocol. A distributed transaction is much slower than a local transaction. The transaction object automatically escalates a local transaction to a distributed transaction when it understands that a distributed transaction is needed. The developer can not do anything here. 1. Transaction Manager: Maintains a log and uses that log if recovery is needed. It controls the whole transaction by initiating and completing, and managing the durability and atomicity of a transaction. It also coordinates transactions across one or more resources. There are two types of transaction managers. Local Transaction Manager: Coordinates transaction over a single resource only. Gloabl Transaction Manager: Coordinates transaction over multiple resources. 2. Transaction Coordinator: Starting the execution of transactions that originate at the site. Distributes subtransactions at appropriate sites so that they can execute in those sites. Coordinates each transaction of each site. As a result the transaction is committed or rolled back to all sites. 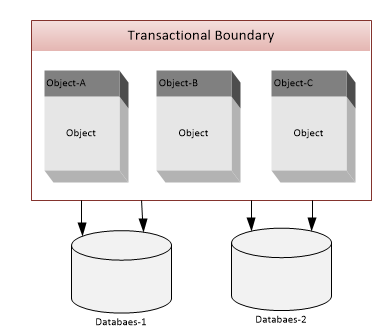 Transaction which is tied directly with a database connection (SqlConnection) is called Connection Transaction. 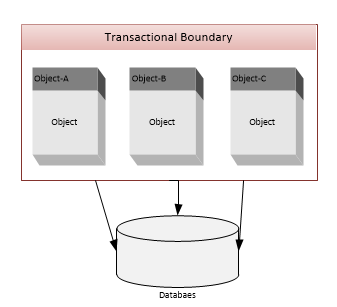 SqlTransaction (IDbTransaction) is an example of a connection transaction. In .NET Framework 1.0/1.1 we use SqlTransaction. Atomic: If all parts of the transaction individually succeed then data will be committed and the database will be changed. If any single part of a transaction fails then all parts of the transaction will fail and the database will remain unchanged. Part of the transaction might fail for various reasons like business rule violation, power failure, system crash, hardware failure, etc. Consistent: Transaction will change the database from one valid state to another valid state following various database rules like various data integrity constraints (primary/unique key, check/not null constraint, referential integrity with valid reference, cascading rules ) etc. Isolation: One transaction will be hidden from another transaction. In another way we can say, one a transaction will not affect an other transaction if both work concurrently. Durability: After a transaction is successfully completed (committed to the database), changed data will not be lost in any situation like system failure, database crash, hardware failure, power failure etc. Now I will start explaining a very important thing directly related to transactions, and that is transaction isolation level. Why is it so important? First of all, I previously explained that isolation is an important transaction property. It describes each transaction is isolated from another and do not affect other concurrently executed transactions. How does a transaction management system achieve that important feature? Before I start explaining isolation levels, I need to explain data reading mechanizm inside a transaction. This data reading mechanism is very important to understand isolation levels properly. Dirty Read: One transaction reads changed data of anohter tranaction but that data is still not committed. You may take decission/action based on that data. A problem will arise when data is rolled-back later. If rollback happens then your decision/action will be wrong and it produces a bug in your application. 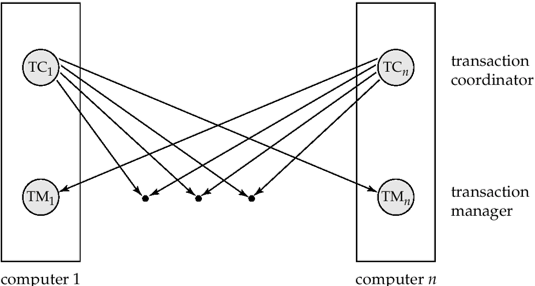 Non Repeatable Read: A transaction reads the same data from same table multiple times. A problem will arise when for each read, data is different. Phantom Read: Suppose a transaction will read a table first and it finds 100 rows. A problem will arise when the same tranaction goes for another read and it finds 101 rows. The extra row is called a phantom row. Serializable: Highest level of isolation. It locks data exclusively when read and write occurs. It acquires range locks so that phantom rows are not created. Repeatable Read: Second highest level of isolation. Same as serializable except it does not acquire range locks so phantom rows may be created. Read Committed: It allow shared locks and read only committed data. That means never read changed data that are in the middle of any transaction. Read Un-Committed: It is the lowest level of Isolation. It allows dirty read. It is very important to know about the default properties of the TransactionScope object. Why? Because many times we create and use this object without configuring anything. Here the TransactionScope object is created with the default constructor. We did not define any value for IsolationLevel, Timeout, and TransactionScopeOptions. So it gets default values for all three properties. So now we need to know what the default property values of these properties. Isolation Level: It defines the locking mechanism and policy to read data inside another transaction. Timeout: How much time object will wait for a transaction to be completed. Never confuse it with the SqlCommand Timeout property. SqlCommand Timeout defines how much time the SqlCommand object will wait for a database operation (select/insert/update/delete) to be completed. 1 Required It is default value for TransactionScope. If any already exists any transaction then it will join with that transaciton otherwise create new one. 2 RequiredNew When select this option a new transaction is always created. This transaction is independent with its outer transaction. How to know the default values of these properties? Is it possible to override the default property values? Yes, you can. Suppose you want the default value to be 30 seconds and the maximum timeout value to be 20 minutes. If that is the requirement then you can do it using your web config. For the machineSettings value, you need to update your machine.config in your server. You need to have a proper knowledge when you use isolation levels. The following table will give you a very basic idea so that you can understand the basics and select the appropriate isolation level for your transaction scope. Serializable It locks data exclusively at the time of read/write operations. For that reason, many times it may create a deadlock, and as a result you may get a timeout exception. You can use this isolation level for a highly secured transactional application like a financial application. Repeatable Read Same as Serializable except allows phantom rows. May use in a financial application or a heavily transactional application but need to know where phantom row creational scenarios are not there. Read Committed Most of the applications you can use it. SQL Server default isolation level is this. Read Un-Committed Applications with these have no need to support concurrent transactions. Create a transaction in which isolation level will be read committed and transaction timeout will be 5 minutes. First off, create TransactionOptions and set ReadCommitted and 5 minutes to its IsolationLevel and Timeout property, respectively. Second, create a transactional block by creating a TransactionScope object with its parameterized constructor. In this constructor you will pass a TransactionOptions object which you created early and the TransactionScopeOption.Required value. One important note, many times we are confused when using a DDL statement (Data Definition Language) in a transaction and a question arises, will it support DDL transaction? The answer is yes. You can use a DDL statement like create/alter/ drop statement in the transaction. You can even use a Truncate statement inside the transaction. We need to create a transaction where a database operation will be in my local database and another will be in a remote database. If you find that type of exception, you need to configure security settings, both your local and remote servers, for MSDTC, and make sure services are running. Allow Remote Clients If it is checked, MSDTC will allow to coordinate remote clients for transaction. Allow Remote Administration Allow remote computers to access and configure these settings. Allow Inbound Allow computers to flow transaction to local computers. This option is needed where MSDTC is hosted for a resource manager like SQL Server. 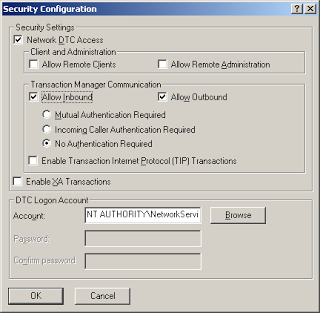 Allow Outbound Allow computers to flow transaction to remote computers. It is needed for a client computer where transaction is initiated. Mutual Authentication Local and Remote computers communicate with encrypted messages. They establish a secured connection with the Windows Domain Account for message communication. Incoming Calling Authentication Required If mutual authentication cannot be established but the incoming caller is authenticated then communication will be allowed. It supports only Windows 2003/XP ServicePack-2. No Authentication Required It allows any non-authenticated non-encrypted communication. Enable XA Transaction Allows different operating systems to communicate with MSDTC with XA Starndard. DTC Logon Account DTC Service running account. Default account is Network Service. Auto Commit: Transaction is committed automatically if all SQL statements are executed successfully or rolled-back if any of them fails to execute. Two Phase Commit: Transaction waits before final commit for messages from all other parties involved in transaction. It locks resources before commit or rollback. For this reason it is called a blocking protocol. In terms of performance it is the reason it is much slower. It is a widely used protocol for managing distributed transactions. Three Phase Commit: Transaction is finally committed if all nodes are agreed. It is a non-blocking protocol. In terms of performance it is faster than the two phase commit protocol. This protocol is complicated and more expensive but avoids some drawbacks in the two phase commit protocol. I want to create a transaction inside another transaction. No problems in creating a transaction inside anohter (nested) transaction. You should define the behaviour or the inner transaction. This behaviour is dependent on the value of TransactionScopeOption. If you select Required as TransactionScopeOption, it will join its outer transaction. That means if the outer transaction is committed then the inner transaction will commit if the outer transaction is rolled back, then the inner transcation will be rolled back. If you select the RequiredNew value of TrasnactionScopeOption, a new transaction will be created and this transaction will independently be committed or rolled back. You must be clear about those concepts before working with nested transactions using TransactionScope. I want to call rollback explicitly from a transaction. Executing Transaction.Current.Rollback() will rollback the current transaction. Executing TransactionScope.Dispose() will also rollback the current transaction. Just one thing: remember that if you explicitly call Transaction.Rollback() or TranactionScope.Dispose() then you should not call the TransactionScope.Complete() method. If you do so then you will get an ObjectDisposeException. I want to create a file/folder dynamically inside a transaction scope. If my transaction is rolled back then I want that created file/folder to be removed automatically, like a database row. TranactionScope is not limited for only databases. It will support other data sources like FileSystem, MSMQ, etc. But you need more work to support TranactionScope. First of all what I show in the above code block will not work. Why? Because that directory creation and file creation will not be marked for transaction by default. Then what do we need to do? The above class will create a directory (folder) and this component is transaction aware. We can use this class with any TranactionScope and if TranactionScope is committed the directory will be created, otherwise it will be deleted (if already created). I show here just the diretory creation, if you want you can create a class/component for file creation. Now, how to use this class in the transactions scope? Transactional NTFS(TxF) .NET is a open source project. You can use this library for creating/writing/coping file/directory inside transactionscope and it will support transaction automatically. Add that component as reference to your project. Use component api to your transactional block. Transaction Management is actually a huge subject. It is a very complex subject too, specially distributed transaction. I tried my level best to present it as simple as possible. If you want to get all transaction related knowledge then you should study more on that. I suggest you read research papers on transactions, specially distributed transactions. You can also explore more regarding transaction aware service/components. I showed here a very simple way to implement them. But in real life you may face difficult scenarios. So you need to prepare for that. In the near future Microsoft may add transaction aware components like dictionary/filesystem/directory service, etc. If it that happens then developers’ life will be more easier. I have attached a source code sample with this article. I wrote this source code with the help of Visual Studio 2012 with .NET Framework 4.5. I added a Unit Test project so that you can debug/test the code and properly understand it.